We got a question for ATXplained about the friendly crossing guard at Pleasant Valley and Palo Blanco. I called Chris to find out why this waving crossing guard caught his attention. Chris has a connection with this guy. 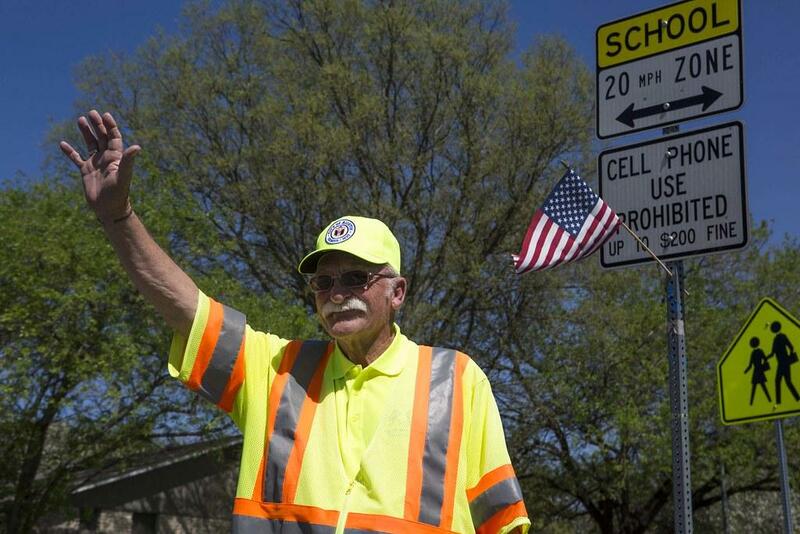 This waving crossing guard is a ritual for him – and he doesn’t even know the guy’s name. But Chris has thought about him a lot. He made up details of his life based on the visual clues he’s gathered. "I see that he has a Marine hat on — maybe a veteran?” Chris wondered. "Maybe has grandkids? I don’t know. I just know that [he’s doing] an exceptional job and he’s done it for years." I arranged for us to go meet this crossing guard. We found him on the corner — right by Mendez Middle School in Southeast Austin. 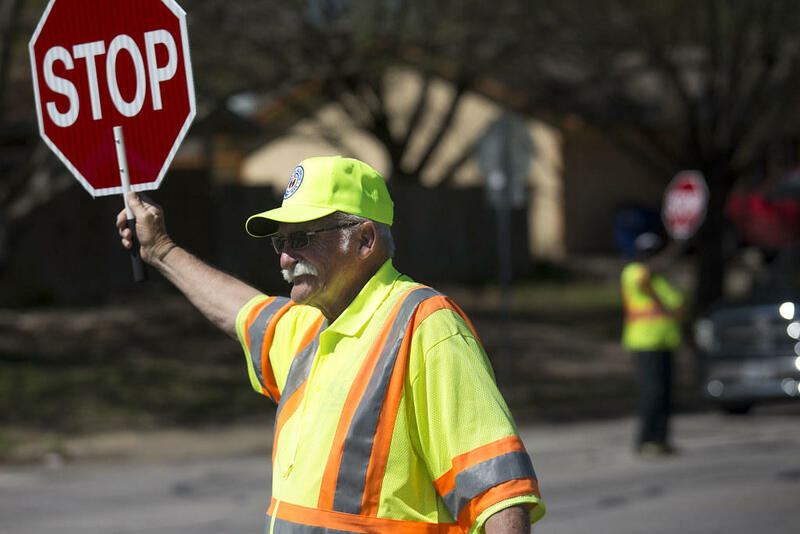 Richard Tuttle, 78, works as a crossing guard for the City of Austin, a position he's held for 15 years. 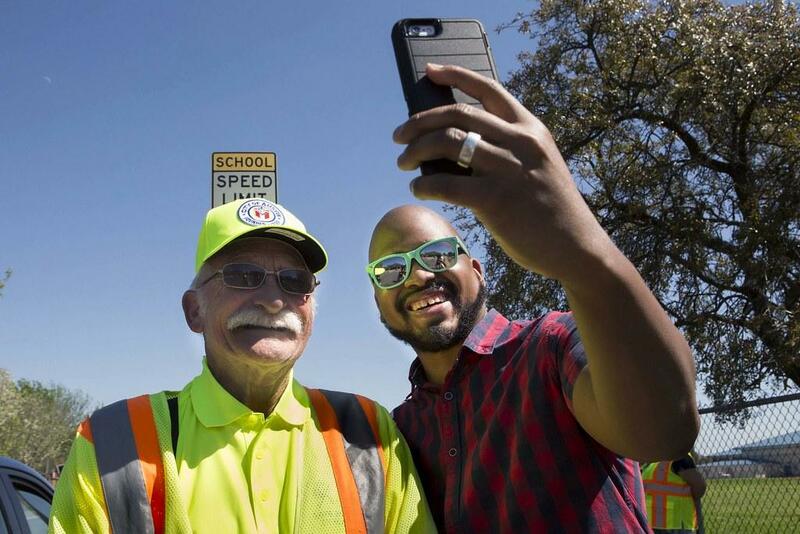 KUT listener Chris Marshall wanted to learn more about the friendly crossing guard whose joy has made Marshall's commute more bearable. His name is Richard Tuttle. He’s 78 years old and lives with his wife about a mile from this intersection. He’s dressed in a bright fluorescent vest and hat. He’s got a white mustache. He’s been on this corner morning and afternoon for 15 years now. He says he hasn’t missed a day — except a few mornings for when he goes to the Cowboy Breakfast at the start of the Austin Rodeo. Richard was a carpenter until he retired. His dad was a carpenter. His grandfather, too. But being totally retired just wasn’t for him. He’s used to early mornings. He grew up on a farm in North Carolina. His family grew tobacco, corn and cotton. His dad would wake everyone up at 2:30 a.m.
“My mom, she always had breakfast on the table at 2:30 in the morning,” Richard said. "Of course, they’re all dead and gone now. But I still think a whole lot about it. I would like to move back home … but I’m too old now to be moving around." "There are so many people who make up the landscape of Austin, and we just don’t know who they are." Richard moved to Austin in the '90s when the construction company he worked for brought him here to work on the new Hyatt Regency hotel on the river. His wife was from Austin, and when he got here, he fell in love with it. Richard's wife has two sons from a previous marriage and they have one grandson — so Chris was right about that (although the grandson is 28 now). He's not a veteran — as Chris suspected — but he feels strongly about the military. He comes from a line of service members. Two of Richard’s uncles died in World War II. He spends some of his off time at the VFW hall and says he understands what military folks go through. He hangs an American flag on a street sign at his intersection to show his pride. Tuttle hangs an American flag on a sign near the corner where he works. Chris asked him: Why does he wave at everyone? It’s more than that to Chris, though. “In a world where we’re so divided and people can’t get along, it’s just nice that without knowing who’s in that car, where they’re going … you’re waving at them,” Chris told him. “You just never know the good that you’re putting out into the world. Sometimes we just don’t know how we impact someone’s life. You’ve impacted my life – and I’m sure countless other people – just by putting that good energy out into the world." "Makes me feel good to know that I have touched somebody around here,” Richard said. As we left, Richard headed out into the intersection to stop the traffic. Tuttle was a carpenter - like his father and grandfather - before he retired. After talking with Richard, Chris seemed satisfied knowing a little more about this fixture in his life. And he said something that made me think about all the people like this in my life: “There are so many people who make up the landscape of Austin, and we just don’t know who they are." So, I’m wondering: Who are the people who make up the landscape of your neighborhood? The postal worker? The cashier at 7-Eleven? The person who’s out there making your neighborhood a little more colorful? We want to hear from you about the people you want to know more about — or the people you think the rest of us should. Tell us who’s making a difference for you or your neighborhood in some way — like the crossing guard who waves at all the passing cars. We’re starting a series we’re calling “Hi, Who Are You?” Tell us who you think we should meet in the form below.